Marshall Street completely changed its identity in the mid-twentieth century. Up to this point, the street was almost exclusively residential, but with the mid-1900s came noticeable change on the street. 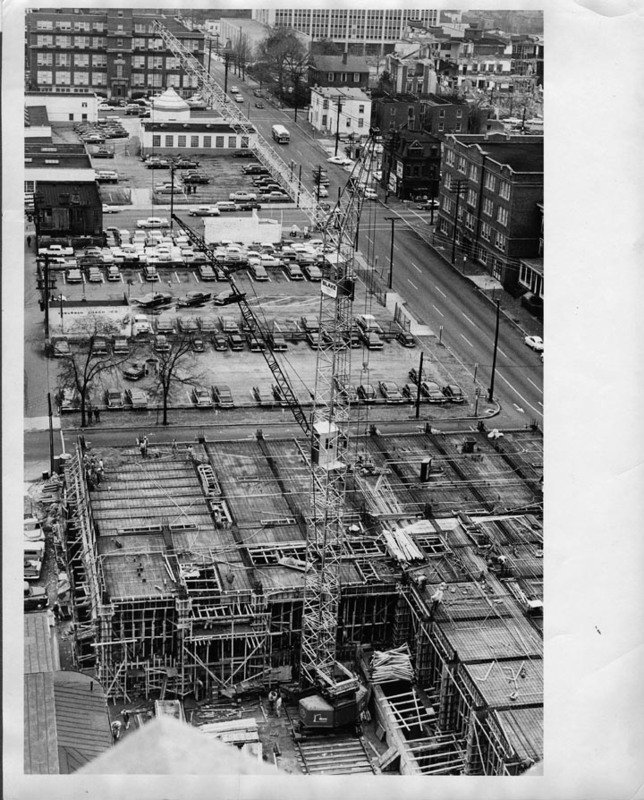 Marshall Street acted as home to many different examples of business development, including the construction of education and government buildings and the opening of parking decks, as the three pictures from the Valentine Richmond History Center show. The expansion of Richmond’s business district to Marshall Street profoundly impacted its architectural foundation, as well as its utility for civilians. ude the portion of Broad Street from Belvidere Street to 4th Street. Unlike the rest of Broad Street, this district was heavily residential. Sanborn maps and Richmond city directories in the early twentieth century reveal just a few businesses in the area. The Historic District’s role in Richmond changed dramatically. Whereas the 1905 Sanborn map shows a residential neighborhood, the 1924 map displays a completely commercial space. Houses were replaced by shops, restaurants, and specialty stores. Entrepreneurs nationwide enjoyed success through this model, but the dramatic decrease in housing availability created a shortage. Displaced city dwellers needed a place to go, and an attractive option emerged. ments in women’s magazines detailed the possibility for a dream house to share with their returning loved ones that would allow life to resume again, as normal. The American Dream was altered to include the acquisition of a suburban house and a car. When the economy boomed after the war’s end, Americans could afford this lifestyle. Since people were content, businesses faced no pressures to halt expansion, and as a result business districts continued to grow. Since the Broad Street Historic District, and more specifically Marshall Street, was now a commercial area, workers needed to drive to work, and a place to park when they reached the city. Richmond adjusted to fix this problem just as the rest of America did; new construction. By the early 1960s, more than fifty percent of some urban business districts were devoted to streets and parking spaces, a statistic that does not take into account the gas stations, car dealerships, or autosupply stores that littered the streets. 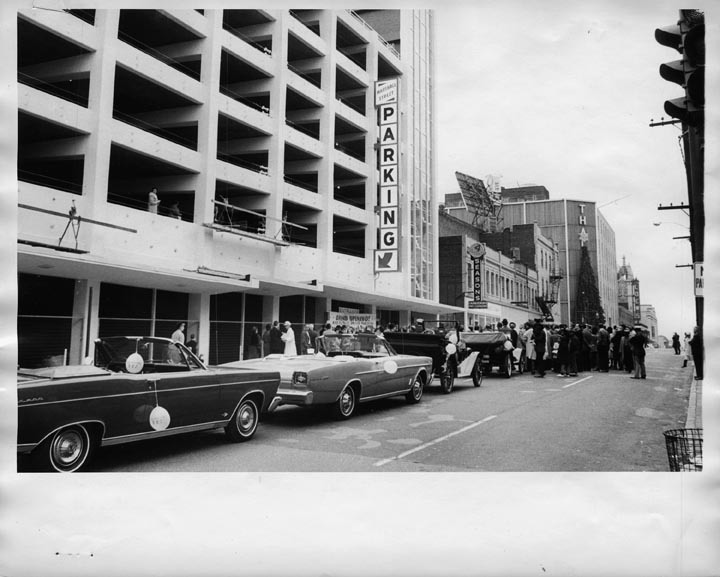 In 1965, a large parking deck was opened on Marshall Street, between 6th and 7th Streets. Open-air, concrete garages identical to the deck on Marshall Street became commonplace nationwide, as the convenience of a self-park area dawned on city developers. The garage on Marshall Street was just two blocks from the boundary of the Broad Street Commercial Historic District, which acted as the center of Richmond’s commercial activity. This was an easy walk for suburbanites who worked in the city. Business districts traditionally focused on retail endeavors, but in the 1950s more commercial enterprises and office spaces were constructed. 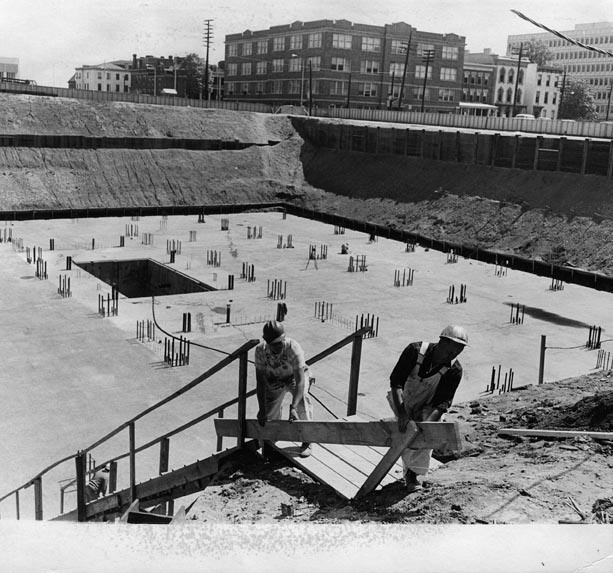 In 1961, the Medical College of Virginia began construction on its new School of Medicine, which opened at the corner of 12th and Marshall Streets in 1963. The school housed headquarters for faculty, offices for departments and administrators, and laboratories. There are many reasons why an urban university improves its city. Public service programs connect the university to the community, neighborhood amenities are developed, richer people move to the area, the local economy is improved due to resident employee programs, and the school’s presence motivates urban youth to succeed in the classroom. Additionally, the expenses of staff and students in the community provide a great influx of money. There were no universities on Marshall Street when it was a residential area; its newfound urban setting persuaded the Medical College of Virginia to construct a school in the area. Richmond VA 23220.” Residential Neighborhoods, Subdivisions and Historic Districts. 2010. Accessed April 17, 2011. http://www.livingplaces.com/VA/Independent_Cities/Richmond_City/Broad_Street_Commercial_Historic_District.html. Development.” June 1999. Accessed April 17, 2011. http://www.umdnj.edu/comreweb/pdf/The_Impact_of_an_Urban%20University.PDF. Suite101.com: Online Magazine and Writers’ Network. December 18, 2008. Accessed April 17, 2011. http://www.suite101.com/content/suburbanization-in-the-1950s-a85087. Imprint on the Landscape.” Automobile In American Life and Society. 2010. Accessed April 17, 2011. http://www.autolife.umd.umich.edu/Environment/E_Overview/E_Overview6.htm. Landmarks & Historic Districts | Examiner.com.” Washington DC News, Washington DC Information, Washington DC Events – Examiner.com | Examiner.com. September 22, 2010. Accessed April 17, 2011. http://www.examiner.com/landmarks-historic-districts-in-richmond/richmond-s-old-city-hall-the-story-behind-the-construction. Experience Your America. Accessed April 17, 2011. http://www.nps.gov/nr/travel/richmond/BroadStHD.html. Home Page – Geography at About.com. 2011. Accessed April 17, 2011. http://geography.about.com/od/urbaneconomicgeography/a/cbd.htm. Communities.” September 2004. Accessed April 17, 2011. http://www.cgu.edu/include/spe/Urban%20Studies%20–%20university%20impact.pdf. News on Politics, Management & Finance. December 2009. Accessed April 17, 2011. http://www.governing.com/columns/urban-notebook/The-Fascinating-History-of.html.